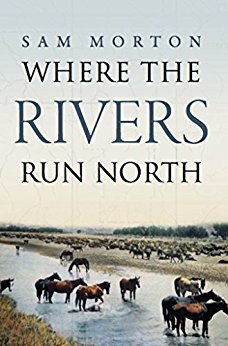 Where the Rivers Run North is more than a collection of horse stories. It follows the lives of people who settled the areas around Miles City Montana and Little Goose Canyon. The battles of Crazy Horse against rival tribes and the United States Cavalry, the adventures of Oliver Henry Wallop carving a name for himself on the frontier, the Gallatin family who brought eastern pageantry to the canyon and Bob Tate, a freewheeling cowboy horse trader. Using the backdrop of the American West, Where the Rivers Run North takes its characters through wars, romance, high times and the depression. The winner of the Wyoming Historical Award, an Independent Book award for best first novel and a High Plains Book Awards finalist, Where the Rivers Run North can be purchased at fullmoon3@msn.com or by calling (561) 914-0915. The author, Sam Morton, is available for speaking engagements and historical tours and can be contracted through the book contact info.